December | 2014 | C'est La Vie -This is Life! What do baby teeth and birthdays have in common? Well, for me, a lot. You see tomorrow I am having my last baby tooth pulled, tooth #T, so the dentist says. It has served me well for 53 years, as I was born without a permanent tooth below it. I also have a BIG birthday coming up on Saturday, January 3, and I am feeling depressed. About both. As long as I had my baby tooth, I felt young and alive at heart. As long as I was in my early fifties, I still felt young and cute, especially since people say I look a decade younger. Turning 54 is not so cute anymore. And, it is definitely middle-aged. I am one year away from being 55 when you can get into the movies on Monday for $6, shop at Ross Dress For Less on Tuesday’s for 10% off, and an assortment of other treats. That’s what my MOTHER does, I think to myself. But, what hit me most was how on Saturday I will wake up and still not have a husband. I implored of the Lord, “How did this happen that I am now a senior citizen and still unmarried? Did you forget to put the husband card in your day-timer of my life? Who will want me with all my sags, memory loss, and turkey neck? I still want to be a mother, and unless you are going to pull another Elizabeth or Sarah number on me, I will not be giving birth. So the tears came. I know some of it was the after-Christmas blues, the ‘why haven’t you opened the door for me to move yet’ and disappointment of not going to Paris for Christmas, because I had to stay home and have my tooth pulled. But, I think it is mostly the realization that I am growing older, alone. Yes, I have my sweet Savior as my best friend and spiritual husband. Yes, I love to spend time with him and go on fun adventures together. In fact, I plan on spending my birthday just with Him, taking English afternoon tea in a tea house in San Francisco and then walking through Golden Gate Park, hand in hand. However, the yearning for a family of my own, a real-live husband and child to spend my ‘glory’ years with tugs at my heart. I laugh with my friends that if I do somehow have a miracle child, I will be too old to bend over and pick her/him up! When I run around the house looking for my glasses, only to find them on my face already or in the shower (huh? ), I mourn the loss of both my estrogen and memory, not necessarily in that order. I wonder why I have suddenly started calling everyone ‘dear’ as my grandmother did? So, I did what every good writer would do, I blogged about it. And as I write this, the Lord reminds me of the gift of life He has given me, when I should have died many times over in my life. That He will bless my birthday with surprises and a heart full of His love, for I am His princess, His daughter and the best is yet to come! My heart is lifted and I place my trust in Him. Goodbye baby tooth, I will miss you! 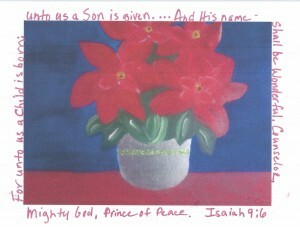 To see my Scripture art and cards, click on ‘my art’ above or giftsofhisglory.com. And share this with a friend LIKE TWEET PINTEREST GOOGLE above. Looking For A Unique Christmas Card and Gift? Christmas is in 25 days. Do you have your Christmas cards yet? Making a list, checking it twice, want to send them out to both those naughty and nice? Why not give a Christmas card with an original art print and greeting, to all your family and friends this year instead of those boring boxed cards? Each card comes on a lovely canvas paper. I have written a beautiful Christian themed greeting inside, or if you prefer, you can get them blank to write your own special greeting. Holiday Special: 6 cards wrapped in cellophane with a holiday bow for the special price of $32. 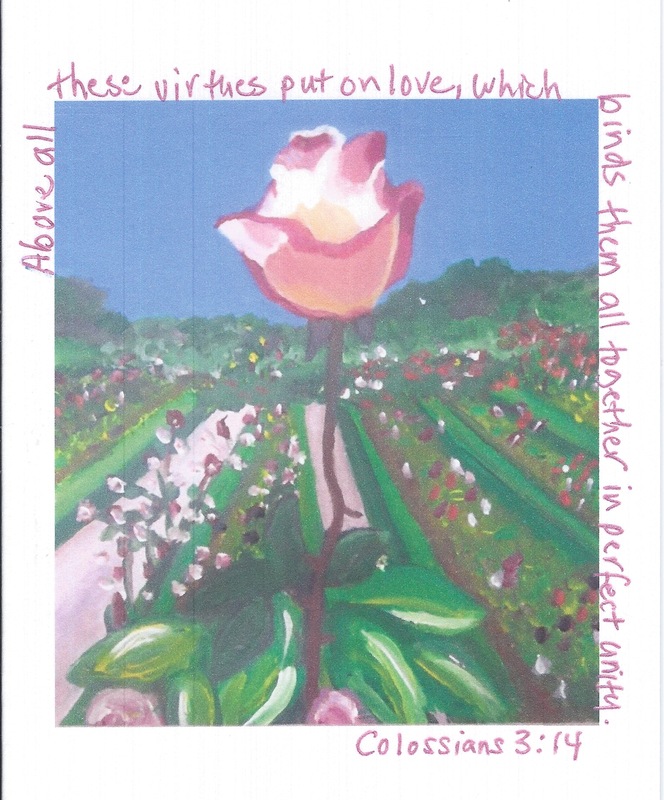 (a $4 savings) Perfect for a gift, mix or match from all 14 cards for many occasions. The cards can then be framed with other cards to make a nice picture for a home. 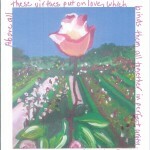 Visit ‘my art’ above or giftsofhisglory.com to see all my greeting cards. There’s still time to order for Christmas. I ship anywhere in the US or Europe. Just send me an inquiry with your order on my contact page.